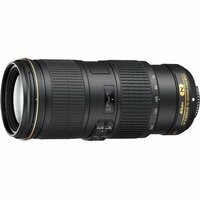 The Nikon 70-200mm f/4 G ED VR Lens is a high-performance telephoto zoom lens with a constant f/4 aperture for use with Nikon's full-frame FX format SLRs. This lens is well-suited to events, travel, wildlife, and sports photography, and is the first Nikkor lens to be equipped with Nikon's next-generation Vibration Reduction system. It has a SWM (Silent Wave Motor) for quiet and accurate autofocus.